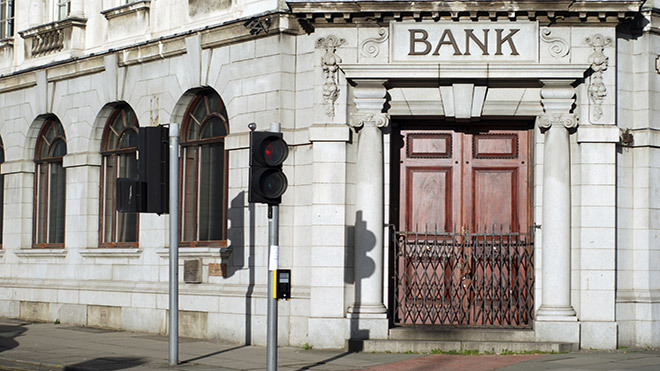 Today the BBC are reporting that over 600 local bank branches have been closed in the last 12 months. It’s a tragedy both for staff who have lost jobs and for the communities that need the service they provided. It also poses a crucial question for unions about how we get the kind of banking system we need in the UK; one that secures the jobs of our six million members and supports the investment needed in our workplaces, communities, and national infrastructure. We need to remember two important points about the 2008 financial crisis and its aftermath. The first is that the crash wasn’t some sort of natural disaster; it wasn’t an act of God; it didn’t fall from the sky. Instead as Nick Macpherson the outgoing head of the Treasury has recently conceded, it was a, “monumental collective intellectual error”; a collective error made by finance ministries, by central banks and by regulators, here in the UK, and across the globe. The second point was this – it was a collective error that happened nearly a decade ago. Now for those of us of a certain age, that doesn’t seem all that long ago. But if you think about the current crop of young undergraduates – or indeed my own 18 year old son who has just started his first full-time job – the financial crisis is something that happened when they had barely left primary school. And yet here we are – nearly a decade on – still getting to grips with this crucial question of how do we get a banking system that works for the real economy. And in our case it’s an economy that is not in good shape. Key industrial sectors like manufacturing are in a precarious position. Deep spending cuts are not only hitting our public services, but reinforcing the fragility of the broader economy. The Chancellor’s so-called Charter for Budget Responsibility has bound the government’s hands on borrowing, precisely when now would be the right time for the UK to borrow to invest in our infrastructure. And while employment growth has been relatively strong, the reality is that workers have faced absolutely unprecedented falls in real wages since the financial crisis. Britain has, unfortunately, become very good at creating large number of low-paid insecure jobs. All this – and the government has missed target after target on deficit reduction. With the government committed to fiscal restraint, monetary policy has had to do much of the heavy lifting to get our economy back on track – £375 billion of central bank money pumped into the system in the form of Quantitative Easing, and other monetary devices such as help to buy, funding for lending. All that means that any gains we have seen on the economic front have been gains that look like those of the pre-crash economy. Continuing property inflation and a housing market wildly out of reach for most; huge amounts of private sector debt; and an unbalanced economy – unbalanced between industrial sectors, and unbalanced between regions despite the rhetoric around the Northern Power House. Against that gloomy back-drop, it’s right to think about what more our banks and financial services can do to get the economy back on a stronger track. In the UK the banking system may be lending, but there is little evidence that that lending is supporting the productive economy. Indeed Bank of England figures show that bank lending to most industries has flat-lined at very low levels – well down on the peaks that we saw at the end of the 20th century. Even in those sectors where you might expect otherwise – like the business services sector – lending is low. Incredibly, the stock of bank lending to manufacturing is now in the same ballpark as it is to agriculture. Where are the exceptions to this general picture? Education and health – perhaps not surprising when you consider the government’s efforts to fragment, privatise and outsource our NHS and our schools. And of course, the real strength in lending is confined to lending to other financial institutions and mortgage lending, which is now seriously elevated relative to the past 20 years. But it’s not just lending statistics that tell us that all is not well. Last year, the TUC’s head of Economics, Nicola Smith helped chair a regional session of the big Bank of England ‘open forum’. Her audience of local business people were absolutely unanimous that the banking system wasn’t delivering. For them, banks were part of the problem, not part of the solution. It was a story I heard repeated by Heather Buchanan of Fair Business Banking at this week’s Transforming Finance Conference. She told horror stories of viable SME’s being driven into insolvency by a toxic combination of bad banking practice and US vulture funds. All of this suggests a wider dysfunction in the relationship between our banks and the rest of society. And it’s a dysfunction that the government and policy makers ignore at their peril, though they seem intent on doing so – after all the Chancellor himself has told us the time for banker bashing is over. The TUC has a very different view – we believe, for example, the decision to scrap the Financial Conduct Authority enquiry into banking culture was a wasted opportunity. Likewise we fear the momentum behind the implementation of the Vickers (Independent Commission on Banking) proposals seems to have been lost – a fact recognised by Sir John Vickers himself who has sounded warnings about what he considers to be insufficient capital buffers. And we know public concern about bankers’ bonuses and executive pay hasn’t gone away. Indeed the gap between the incomes of our top bankers and the broader public – and indeed their own staff who all too often have been at the sharp end of branch closures, difficult working conditions, low pay, outsourcing and off-shoring has perhaps never been sharper. So, far from embracing ‘business as usual’, we believe there is more that could be done to get our banks on the right track. We’ve called for borrowing powers for both the British Business Bank and the Green Investment Bank and a roll back on privatisation of the Green Investment Bank. We’ve also called for a review of the implementation of the Vickers proposals to ensure that the UK develops a strong and robust banking system capable of servicing the wider economy. But perhaps, now is the time to go further. Perhaps the Bank of England should have a remit to more fully report on and assess productive lending into the economy? And – of direct interest to those who TUC unions represent in financial services – perhaps there is more that those at the top of our banks could do to meet staff, and wider public, concerns about spiraling top pay? More pay transparency yes – but we believe we could be much more radical. Is now the time for a major UK bank to lead the way for UK PLCs and open up their remuneration committee to shop floor staff and other stakeholders? More broadly, can we learn the lessons from much of Western Europe, where 19 countries have some sort of provision for worker involvement at board level and in the big strategic decisions that affect the lives of working people? Fundamentally, unions want to play a part in designing a financial system that works for the real economy. And that is not a new idea. In 1929 Ernest Bevin, then General Secretary of the Transport and General Workers Union, and later Foreign Secretary to the post-war Labour government, was appointed to the Macmillan Committee inquiry into Finance and Industry. Just as Bevin saw the need for the trade union movement to raise its head from the immediate issues of pay, terms and conditions to look more deeply at the inter-relation between banks and the wider economy, so to today is the TUC keen to engage in this vital debate. These questions were the subject of a conference – ‘Transforming Finance 2016: Follow the Money ‘ – hosted by the Finance Innovation Lab this week, and this post is partly based on remarks I made for a session on ‘what would a finance system that serves the real economy look like?’. Thanks for this post, and congratulations on a great speech given at the Transforming Finance. “Perhaps the Bank of England should have a remit to more fully report on and assess productive lending into the economy?” Definitely, support this. As mentioned, perhaps it could go one step further. It could consider recycling money made available via QE into real economy. It could re-invest money made available yearly, as and when bonds held under QE mature, into the bonds issued by the above mentioned Green Investment Bank, British Investment Bank, and Green Investment Bank.